Pair your minibon with a soothing and refreshing chillata drink, the creamy Cinnabon Chillatta, a chocolate-filled frozen Nutella blend that is perfect to quench the heat of the season. 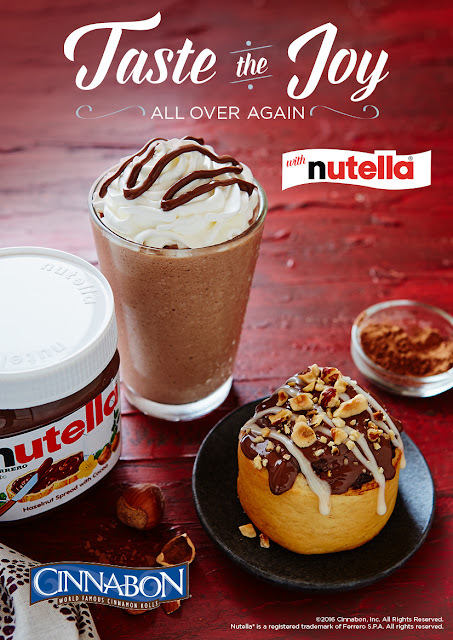 Grab the Cinnabon Nutella for Php 95.00 only. Available in Cinnapacks of 4 (Php450.00) and 9 (Php 570.00) in all Cinnabon stores nationwide and experience the Nutella loving craze! Founded in Seattle in 1985 and now based in Atlanta, Cinnabon, Inc. is the market leader among cinnamon roll bakeries. The company serves fresh, aromatic, oven-hot cinnamon rolls, as well as a variety of other baked goods and specialty beverages. Cinnabon Philippines is under the exclusive franchise of Canelle Food Corporation which opened the very first Cinnabon bakery in Asia. To date, there are 16 Cinnabon bakeries serving the indulging signature Cinnabon rolls. To get the latest updates, follow Cinnabon Philippines on Facebook and Instagram.